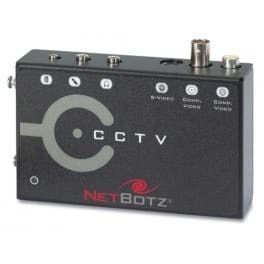 The NetBotz CCTV Adapter Pod 120 (NBPD0123) is designed to be used with NetBotz 570 and 400 appliances and a single closed circuit television (CCTV) or other video source, the CCTV Adapter Pod accepts multi format S-Video and Composite Video and features DIN, BNC and RCA input jacks. This pod also features a USB port that enables the pod to be tethered to the base station using a standard USB cable. Using the CCTV Adapter Pod, your analogue video source is digitally converted and integrated with the NetBotz physical security solution. Streaming audio (using the pod’s integrated microphone or an external microphone connected to the pod) is also available.